Professor Kenneth Waltzer, Michigan State University, offered those words of congratulation “belief, determination, and persistence”, he was among a handful of scholars who believed in my book from the very beginning. Professor Matthew Feldman, Teesside University, UK, gave me his unyielding support throughout my long journey. 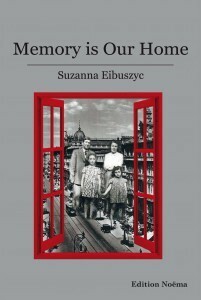 Memory is Our Home is written with the high school, college age reader in mind and beyond. A rich, living document, a thirty-year account that reveals a vibrant life of my mother’s family and the Eastern European, twentieth-century Jewish history and culture. Fascinates from the early paragraphs, rarely has a book been written that pencils so bleak a portrait of daily Jewish life during the interwar years in Poland, the Poland that was under Nazi’s murderess grip and the faith of Jews surviving throughout Russia and Uzbekistan during WWII. My mother survived against all ads, in Russia, in the midst of all the tragedy she even experienced love. What followed was a shocking repatriation to the “vast graveyard” and Jewish life under a new kind of oppression, communism, in postwar Poland. Based on my mother’s diary, interwoven with her journals are stories she told to me throughout my life, as well as my own recollections as my family made a new life in the shadows of the Holocaust in Communist Poland after the war and into the late 1960s. By retelling this story I try to shed light on how the Holocaust trauma is transmitted to the next generation, the price my family paid when we said good-bye to the old world and the challenges we faced in America. It is said that in every survivor’s family, one child is unconsciously chosen to be a “memorial candle,” to carry on the mourning and to dedicate his or her life to the memory of the Shoah. That child takes part in the parents’ emotional world, assumes the burden, and becomes the link between past and future. I realize now that my mother chose me to be that candle. Aaron Elster, Vice President, Illinois Holocaust Museum and Education Center, child survivor. A rich, living document, a thirty-year account that reveals the life of a vibrant young woman with hopes and dreams for a better world who lived to bear witness to unspeakable suffering and all that she saw, felt, and thought. It is a story of sacrifice, determination, loyalty, and love. It pays tribute to our history and legacy that is now almost forgotten, the vibrant Jewish culture of Eastern Europe that was forever decimated by the events of WWII. Leaving Communism behind and starting a new life in America at age fifty, it was at great risk to her safety and sanity that she re-entered the world she suppressed for so long in order to write her story. She bravely faced the ghosts she left behind in Warsaw and Russia, bringing them back to life to acknowledge and honor her strength to survive. My mother hesitated to re-enter the memories and bear the pain she suppressed for so long, but in the words of Elie Wiesel “silence is never an option“, so at great risk to her sanity and her health she agreed to commit her memories to paper. She wrote in her native language, Polish, the journals she called Beshert, Meant to Be, to honor her generation that had perished so that future generations have a way to remember the vibrant Jewish community that flourished before WWII. Once Poland was the home to the largest Jewish community in Europe. The Jewish culture in Poland flourished for one thousand years. Before WWII, over 3.3 million Jews lived there, making it the second largest Jewish community in the world. WWII destroyed this community completely, devastating their distinctive culture and society. The extent of the loss was so great, so destructive; we know it as the Holocaust, the Shoah. Six years ago, on the day of my mother’s death, I opened the box containing her notebooks. Writing in Polish, in a shaky hand, my mother filled pages with the memories of her childhood and young adulthood in Warsaw in the interwar years, her struggle to survive as a young Jewish woman in slave labor in the Soviet Interior, during World War II. It is crucial that the story of my mother’s generation is shared with future generations. Content copyright 2015. Suzanna Eibuszyc. All rights reserved.